Wrightstyle, based in the UK, supplies specialist steel and aluminium glazing systems worldwide, and has supplied shopping centres internationally. Jane Embury, the company’s marketing director, looks at retail trickery and the power of light to seduce shoppers. It’s that time of year, from Black Friday to the January sales, when we indulge in a shopping frenzy. But not is all that it seems in the murky world of retail. Estee Lauder chairman Leonard Lauder says that you can tell the state of the economy by sales of red lipstick. When times are tough, he believes, women will buy lipstick rather than indulge themselves in something more expensive. That, in a sense, is the retailer’s problem: how to encourage us to part with money we don’t have to buy things that we don’t really want. That’s the basic premise of the new science of neuromarketing, to better understand the factors influencing buying decisions that may be below our consciousness. For example, studies suggest that shoppers in a bookstore linger longer if there is an (undetectable) smell of chocolate in the air; likewise women in a baby and toddler shop if it seems to smell of baby powder. Similar studies have been carried out for product lines aimed at both men and women. The mind-games get weirder in a branch of scientific observation that now has a name: environmental psychology. For example, a New York retail consultancy has found that we walk around shops in the same way as we drive a car. If we drive on the right, we tend to keep to the right when walking down sidewalks or supermarket aisles. Conversely, the British and Australians tend to turn left when entering a store. "In an environment of natural light, seemingly connected to the outside world, we’re more relaxed and prepared to linger and lingering means buying stuff." Sounds unlikely? Well, putting the theory into practice, it means that in a well-designed airport travellers walking to their gates should find fast-food outlets on their left and gift shops on their right. The mind game being played here is that, if a traveller is hungry, he or she is happier to cross a lane of pedestrian traffic to buy something to eat. However, they’ll rarely do so to make an impulse gift purchase. Most retail psychology focuses on the design of retail space, from aisle widths to the use of colour, from ambient and artificial lighting to the configuration of product displays. Getting all that right, and bringing the store’s brand to life, has always been seen as key to maximising sales. By recognising how colour influences us, retailers are better able to induce feelings of warmth, intimacy or serenity or, by using more vibrant palettes, to excite or stimulate. It’s about knowing, for example, that shoppers will spend longer on a red carpet than a blue one. We react fundamentally to colours because they help us make sense of our surroundings; indeed, some 80% of information reaches our brains via our eyes. It means that we are instinctively more comfortable when colours remind us of something familiar – for example, a soft shade of blue triggers associations with the sky and a psychological sense of calm. We all share similar responses to colour, although cultural variations exist. For example, white is the colour of marriage in western societies but is the colour of death in China. In Brazil, purple is the colour of death. Yellow is sacred to the Chinese, but signifies sadness in Greece and jealousy in France. But one retail trend into which we can all buy into is the much greater use of ambient light, particularly in shopping centres that were once closed in and claustrophobic. Studies back that simple fact up: increased natural light equals increased sales. In an environment of natural light, seemingly connected to the outside world, we’re more relaxed and prepared to linger and lingering means buying stuff. At Wrightstyle, we’ve been involved with shopping centres in the UK, Middle East and APAC regions. 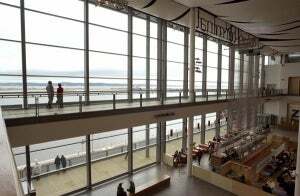 In the UK, a good example is Ocean Terminal, one of Scotland’s largest shopping centres and home to the Royal Yacht Britannia, whose complex’s frontage consists of one of the UK’s largest free-span curtain walling systems, and covering one entire side of the shopping centre. The effect is pure theatre and a retail and leisure destination for visitors across a wide region. The same was true in Hong Kong’s Langham Place development, which includes a 53-storey office tower, a five-star hotel with 665 bedrooms and rooftop swimming pool, as well as a 600,000ft² shopping mall with 300 shops. Our curtain walling, spanning seven floors, protects walkways between the main building and the shopping area, an important escape route in the event of a fire. Once again it was the innovative use of glass to ‘open out’ the shopping centre that has helped Langham Place become an iconic part of the cityscape, and transform an area of Hong Kong that was blighted and neglected. That aspect of regeneration was also evident in another project we undertook in Beirut, Lebanon, to redevelop the Solidere Beirut Souks, which had been badly damaged in the country’s civil war. The project has created the Lebanon’s largest shopping area, with more than 200 retail outlets, as well as leisure, entertainment and other public spaces, bringing back to life an area of the city that had been badly scarred. Once again, bringing in light was key: creating interior spaces that were connected to the world beyond, creating a leisure and retail destination that, in turn, has helped to transform the city. Our glazing systems are designed to contain fire within discrete areas, protect escape routes, and can offer complete protection against ballistic or bomb attack. That’s how far glazing systems have come in recent years; optically brilliant, but enormously protective. And, by letting the outside in, they also encourage people to shop, shop, shop. Sadly, this year, it’s red lipstick for me.